Total Annihilation creator Chris Taylor says that StarCraft 2 shows how successful PC games can be when there's some monetary muscle behind them. There's an old saying that you have to spend money to make money, and Taylor thinks that that is especially true when it comes to core PC games. He believes that if developers and publishers were willing to invest big money into PC titles, then sales will inevitably follow. He held up StarCraft 2 as an example of a game that proves his point, and said that the RTS genre was considered to be on its last legs until Blizzard brought it back in a massive way by spending a ton of money of making and publicizing the game. "[T]here's a kind of chicken and egg thing here," he said. "Blizzard spends around $100 million-plus, so of course they're going to do $300 million in sales." It wasn't just Blizzard who enjoyed the success either. 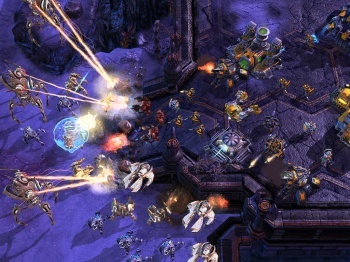 Taylor said that months before StarCraft 2 launched he saw a surge in the level of interest in RTS games. "It's like a dividend," he said. "Same idea; our phone was ringing off the hook on the ramp up [to StarCraft 2's release]." StarCraft 2 is certainly an example of how well PC only games can sell, although to suggest that success is directly proportional to the amount of investment is perhaps a little simplistic. APB also reportedly had $100 million spent on it, and it crashed and burned just a few months after release, showing that what you spend the money on is just as important as how much you have. But Taylor's core point - that if developers and publishers supported PC games better, sales would go up - has a lot of truth to it.